Click on the courses below, to view the course details. The HAZWOPER Refresher course is an 8-hour, one-day class. The HAZWOPER refresher course re-certifies and maintains competencies learned in the HAZWOPER 24-Hour or 40-Hour courses and must be taken annually. Training provided by P2R Academy is supported by the National Institute of Environmental Health Sciences (NIEHS) of the National Institutes of Health (NIH) under awards. U45ES019360 and UH4ES027055. El propósito de este entrenamiento es proporcionar los principios básicos de la preparación para emergencias. Las emergencias pueden atacar sin previo aviso. No solo puede verse afectado su hogar sino también su lugar de trabajo, comunidad, estado o nación. La ayuda puede tardar horas o días en llegar. Este curso le ayudará a prepararse a Ud. mismo, su familia, lugar de trabajo y comunidad. Este curso es un guión de información resumida destinado a la población en general para que se prepare en emergencias generales. Este no es un curso exhaustivo sobre la preparación para emergencias y no sustituye a las instrucciones o avisos de las autoridades. The purpose of this training is to provide the basic principles of emergency preparedness. Emergencies can strike without warning. Not only can your home be affected but also the workplace, community, state or nation. Help may take hours or days. This course will help you to prepare for yourself, your family, workplace and community. This course is an outline of summary information meant for the general public to prepare themselves for general emergencies. This is not an inclusive course in emergency preparedness and does not supersede the instructions or advisories of authorities. The purpose of this training is to provide to the general public with a basic information about fire safety, including simple fire science concepts and we’ll offer best methods for responding to small fires. This is not a comprehensive course. Este curso está diseñado para enseñarle como tratar heridas básicas y enfermedades repentinas hasta que personal médico avanzado llegue a la escena. El hecho de reconocer y proveer intervención rápidamente puede minimizar los efectos de las heridas y enfermedades. 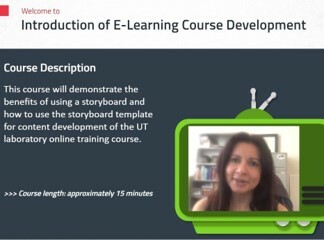 This course will demonstrate the benefits of using a storyboard and how to use the storyboard template for content development of the UT laboratory online training course. Multiple federal agencies have identified an emergent emergency medicine challenge: In an emergency situation, is the presenting patient suffering from an opioid overdose or from intentional poisoning by a chemical nerve agent? This key differential diagnosis carries with it important decisions related to the deployment of protective measures for both the healthcare community and public health. To an untrained eye, the signs of opioid and nerve agent poisoning may appear similar, but the health risks to the patient and responder are different. List the appropriate public health and law enforcement notification when a nerve agent poisoning is strongly suspected. This module serves to ensure that everyone has the knowledge and skills to prevent dangers associated with common post-flood infectious diseases and hazards. With the recent devastating hurricanes of Harvey and Irma, severe and catastrophic weather and floods will be something that continues to affect communities throughout the United States. The purpose of this training is to provide general guidance to workers in ambulatory care clinics located in academic centers so that workers may protect themselves through the use of personal protective equipment (or PPE) in the event that they suspect a patient may be infected with the Ebola virus. El objetivo de este adiestramiento es proveer orientación general a los empleados de las clínicas de cuidado ambulatorio ubicadas en centros académicos para que puedan protegerse mediante el uso de equipo de protección personal (o PPE) ante la eventualidad de sospecha que un paciente pudiera estar infectado con el virus del Ébola.